Some 9 miles, SSE of Arlington, the Montague Wind Power Project is being built by Apple which has two data centers in Prineville and is building a third. Meanwhile, Facebook is building a 5th datacenter in Prineville. Google has its own collection of data centers in The Dalles. Cheap hydropower from dams make Oregon and Washington good spots for data centers. Pendleton probably shouldn’t be included in this list since it is far south of the Columbia River, but what the heck. It’s home to the Pendleton Roundup and the Pendleton Woolen Mills. Less well know is the Pendleton UAS range which tests autonomous Airbus Sky Taxis that may be used by Uber. Amazon plans to build a new 120-acre data center park in Umatilla. 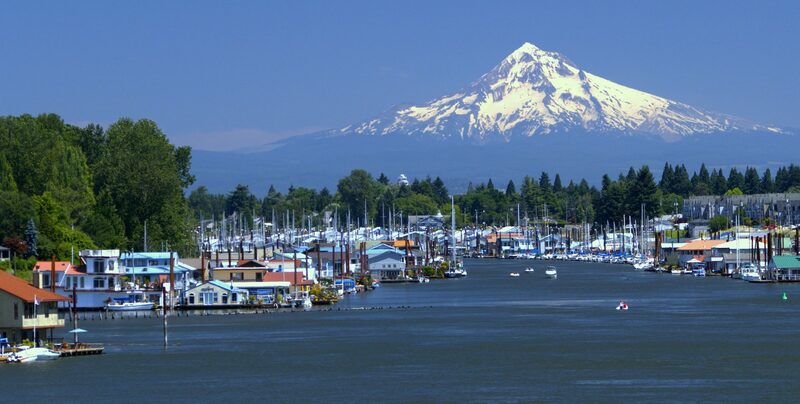 The facility will join on of their three sites in East Oregon, at the Port of Morrow Industrial Park (Boardman) and at the McNary industrial park just outside of Umatilla. The City of Kennewick (pop 75,000) in Benton County, is one of the TriCities that include Kennewick, Pasco and Richland. The Snake River, at 1,078 miles long, is the largest tributary of the Columbia River. The Snake River Plain was created by a volcanic hotspot which now lies underneath Yellowstone. More than 11,000 years ago, prehistoric Native Americans lived along the Snake and Oregon Trail pioneers followed the Snake River. Hells Canyon, along the border of eastern Oregon, eastern Washington and western Idaho is part of the Hells Canyon National Recreation Area and is North America’s deepest river gorge at 7,993 feet. The Snake and Yakima rivers feed into the region. The Tri-Cities boasts more than 200 wineries within a 50-mile radius, producing some of the finest wines in the world. The City of Richland (pop 51,150) is near the Hanford nuclear site, which refined plutonium for the Fat Man bomb used to attack Nagasaki in 1945. The historic B Reactor, the world’s first plutonium production reactor, is now a museum. Hanford is currently the most contaminated nuclear site in the United States and is the focus of the world’s largest environmental cleanup. For centuries the Wanapum, Yakama and Walla Walla Indians harvested salmon here, entering the Yakima River. Today that village site is called Columbia Point. The Sacagawea Heritage Trail travels along the Columbia River through the Tri-Cities. The 23-mile multipurpose blacktop loop trail on both sides of the river goes from Sacagawea State Park at the confluence of the Snake and Columbia Rivers up to the I-182 bridge at the Columbia Point Marina on the upper end. Three bridges provide a number of ride options. The Columbia River, with an average flow of 265,000 cubic feet per second, produces 44 percent of the nation’s hydroelectric power. All this cheap power – 2-3 cents per kilowatt/hr, caused Microsoft, Amazon, Google and others to build some of the world’s most advanced data centers along the Columbia. It has also been a boon for Bitcoin miners who have made Wenatchee Washington the “Bitcoin mining capital of the USA”. Bitcoin miners are on track to use more power than all the residents combined! Cloud computing may be the new Manhattan Project and the Pacific NW Labratory may be a good location for Quantum Spys. Hanford Reach is a free-flowing 51 mile section of the Columbia River, near Hanford, the only section of the Columbia that is not tidal nor part of a reservoir. The Reach National Monument is part of the Columbia River Plateau, formed by basalt lava flows and water erosion. Just upstream is the Priest Rapids Dam, located at mile marker 397 from the mouth of the Columbia. This is as far upriver as we’re going on this virtual tour. Time to head back. Thanks for your company on this adventure! Let’s do it again sometime.